MasteringPhysics® not included. Students, if MasteringPhysics is a recommended/mandatory component of the course, please ask your instructor for the correct ISBN and course ID. MasteringPhysics should only be purchased when required by an instructor. Instructors, contact your Pearson representative for more information. MasteringPhysics is an online homework, tutorial, and assessment product designed to personalize learning and improve results. With a wide range of interactive, engaging, and assignable activities, students are encouraged to actively learn and retain tough course concepts. · A research-based problem-solving approach (Identify, Set Up, Execute, Evaluate) is used not just in every Example but also in the Problem-Solving Strategies and throughout the Student’s and Instructor’s Solutions Manuals and the Study Guide. This consistent approach teaches students to tackle problems thoughtfully rather than cutting straight to the math. NEW! DATA problems appear in each chapter. These typically context-rich data-based reasoning problems require students to use experimental evidence, presented in a tabular or graphical format, to formulate conclusions. NEW! Passage Problems appear in each chapter and follow the format used in the MCAT exam. These problems require students to investigate multiple aspects of a real-life physical situation, typically biological in nature, as described in a reading passage. REVISED! Bridging Problems help students move from single-concept worked examples to multi-concept problems in the end of chapter and are revised based on reviewer feedback, ensuring that they are effective and at the appropriate difficulty level. Extensive problem sets cover a wide range of difficulty and exercise both physical understanding and problem-solving expertise. Many problems are based on complex real-life situations. Problem-Solving Strategies coach students in how to approach specific types of problems. The number of Examples and Conceptual Examples exceed all other leading calculus-based texts, exploring problem-solving challenges that other texts don’t address. NEW! Annotated equations appear in all key equations to help students make a connection between a conceptual and a mathematical understanding of physics. The Art Program uses a simplified graphical style to focus on the physics of a situation and incorporates explanatory annotations. Both techniques have been demonstrated to have a strong positive effect on learning. Figures that illustrate Example solutions often take the form of black-and-white pencil sketches, which directly represent what a student should draw in solving such a problem. REVISED! Annotated figures enable students to draw the connection from photos, illustrations, and diagrams to the text discussion. NEW! Data Speaks sidebars, based on MasteringPhysics metadata, alert students to the statistically most common mistakes made when working problems on a given topic. Caution paragraphs have been revised to ensure that students get to the point quickly to focus them on typical misconceptions and problem areas. Learning Goals appear at the beginning of each chapter to help students focus their efforts. NEW! Looking back at … Essential past concepts are listed at the beginning of each chapter to let students know what they need to have mastered before digging into the current chapter. End-of-section Test Your Understanding questions let students check their grasp of the material and use a multiple-choice or ranking-task format to probe for common misconceptions. Visual Summaries at the end of each chapter present the key ideas in words, equations, and thumbnail pictures, helping students review more effectively. NEW! Chapter-Opening Questions have been revised for clickers, so that instructors can easily initiate a classroom discussion. Most of the clicker questions have been written by Roger Freedman. QR codes throughout the book allow students to use a mobile phone to watch Video Tutor Demonstrations and Video Tutor Solutions instantly. MasteringPhysics not included. Students, if MasteringPhysics is a recommended/mandatory component of the course, please ask your instructor for the correct ISBN and course ID. My##Lab should only be purchased when required by an instructor. Instructors, contact your Pearson representative for more information. NEW! Interactive Pre-lecture videos address the rapidly growing movement toward pre-lecture teaching and flipped classrooms. These videos provide an introduction to key topics with embedded assessment to help students prepare before lecture and to help professors identify student misconceptions. Pre-lecture Concept Questions check students’ familiarity with key concepts, prompting them students to do their assigned reading prior to coming to class. These quizzes keep students on track, keep them more engaged in lecture, and help you spot the concepts with which they are havinghave the most difficulty. Open-ended essay questions help students to identify what they find most difficult about a concept, helping to better informing you and assisting with “Just-in-time” teaching. 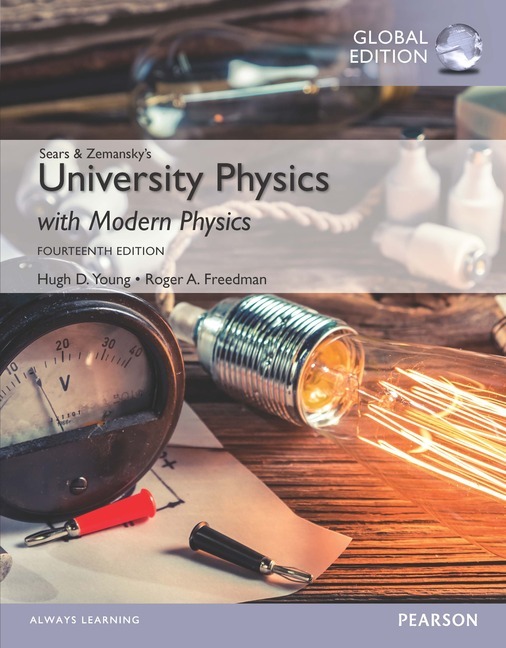 Tutorials featuring specific wrong-answer feedback, hints, and a wide variety of educationally effective content guide your students through the toughest topics in physics. The hallmark Hints and Feedback offer instruction similar to what students would experience in an office hour, allowing them to learn from their mistakes without being given the answer. NEW! Adaptive Follow-Ups are personalized assignments that pair Mastering's powerful content with Knewton's adaptive learning engine to provide personalized help to students before misconceptions take hold. These assignments address topics students struggled with on assigned homework, including core prerequisite topics. NEW! An Alternative Problem Set in MasteringPhysics offers instructors more choices when creating assignments with hundreds of new questions and problems. Video Tutor Demonstrations and Video Tutor Solutions tie directly to relevant content in the textbook and can be accessed through MasteringPhysics or from QR codes in the textbook. Revised! Video Tutor Solutions (VTSs)for every Example and Bridging Problemin the book walk students through the problem-solving process, providing a virtual teaching assistant on a round-the-clock basis. New VTSs correspond to new and revised worked examples. NEW! Video Tutor Demonstrations (VTDs) feature "pause-and-predict" demonstrations of key physics concepts and incorporate assessment to engage students in understanding key concepts. New VTDs build on the existing collection, adding new topics for a more robust set of demonstrations. Instructor and student note-taking, highlighting, bookmarking, and search.